Who are you voting for this year? Some are choosing to vote for mercy. That was the slogan printed on the t-shirts that designated the over 150 pilgrims who made their way to the shores of Orchard Lake from parishes from across the Archdiocese of Detroit. Mike Chamberland of the Archdiocese of Detroit had coordinated last weekend’s special event on the historic Orchard Lake Schools campus months ago with JJ Przewozniak and Kelley Stramaglia of The Polish Mission. The plan? To create a World Youth Day experience for pilgrims on our home turf. On the 100th anniversary year of the founding of the Orchard Lake Schools in 1985, World Youth Day was instituted by St. John Paul II. Since its inception, WYD has drawn millions of pilgrims from across the world to locations from Buenos Aires, to The Philippines, to Australia, and many places in between. The Guinness Book of World Records credits the 1987 WYD event in the Philippines as the largest gathering of people for a religious event. Over 4 million pilgrims made the journey to celebrate their Catholic faith. This year, over 180 countries were represented in Krakow, Poland, as throngs of people welcomed Pope Francis to his first visit to the country. A well-known bulwark of Catholicism, Poland’s Catholic character dates back to the year 966 when Duke Mieszko I was baptized, beginning a centuries-long legacy of Roman Catholic governance. St. John Paul II was formed by this legacy of faith, as were countless other religious figures, such as St. Maximilian Kolbe (d.1941) and St. Maria Faustyna Kowalska (d.1938) in recent years, and others from the pages of history, like St. Hedwig the Queen (d.1399) and St. Hyacinth of Poland (d.1257). Against this backdrop, Mike and his colleagues at the Archdiocese, following a tradition of World Youth Day Home events in the past, looked to The Polish Mission for a way to offer our community’s faithful youth the chance to experience a Polish legacy. There was no better location. Many know that St. John Paul II visited the Orchard Lake campus twice in his lifetime, residing in the historic 1858 castle building, celebrating mass at the Chapel of our Lady of Orchard Lake, and even sailing a kayak on Orchard Lake during a choppy day in 1976. These saintly hallmarks guide The Polish Mission today, but what’s under the surface of those epic moments of history, is the legacy of distinctly Polish character interwoven in the 131-year history of The Polish Mission. As America’s oldest Polish cultural and educational institution, the Polish identity has been infused over the years into countless students and seminarians, and to this day Polish can still be heard in our hallways, and traditional customs and celebrations are marked on the campus calendar. Following a successful stream of Polish cultural activity, developments were quickly put in place for an enriching and fulfilling weekend that would leave the WYD pilgrims with an unforgettable memory: experiencing Poland 5,000 miles away from Kraków. True to World Youth Day in Krakow, July 30th began with the looming threat of rain, but as in Poland, it did nothing to dampen our enthusiasm. The day began in the our historic Old Gym, Michigan’s oldest continuously-operating gymnasium, in which the young people, their chaperones, and Archdiocese staff gathered for the opening icebreaker, welcome, and keynote address. True to the international character of Catholicism, JJ Przewozniak welcomed Fr. Abraham Maziku of the Diocese of Kahama Tanzania, to lead the opening prayer for the group. “It is amazing to see the spirit of the young people gathered here at this Polish place. It is something very special, and I am thankful to have taken part in this beautiful, prayerful celebration,” he said. “JJ has told me of this Polish place in America many times, and I am so happy to see the Polish character of this place for World Youth Day.” Fr. Abraham is in the United States as a guest of Fr. Ben Kosnac, pastor of SS. Cyril and Methodius Church in Sterling Heights, and is a long-time associate of JJ’s for missionary outreach programs. That special arrangement for WYD was a real blessing that was only the first of a weekend full of inspiration. Following the prayer, JJ gave a welcome speech that called upon the memory of important history, such as the August 1st anniversary of the Warsaw Uprising in 1944, and he also brought to memory some fine details of St. John Paul II’s visit to the campus. It was reported by a witness to that special time when he prepared to shove off from the docks in a kayak that he asked a colleague on the shore: “You’re coming with me, right?” Those few words ring true in many ways to our ears today, in which Christians face challenges and temptations that could capsize the little boats in which we sail, on the daunting open waters of the world. That little quote reminds us of the need for fellowship, the need for oneness, and it reminds Catholics that together in prayer, any hurdle can be surmounted. St. John Paul II returned to the lakeshore unscathed following his voyage in ’76, and like him, with faith we too shall surmount any challenge. With that, the day began in earnest with an inspirational keynote address by guest speaker Mike Patin. Claps of thunder shook the windows of the Old Gym, as if to ironically announce the beginning of the day’s outdoor activities. Undeterred, the pilgrims donned ponchos, and gathered outside to begin a 5k pilgrimage walk around the campus. “We walk by faith, and not by sight,” came to mind as everyone followed tightly behind Mike, mostly in prayerful silence, but with the occasional smile toward old and new friends. Regrettably, the processional cross would have made an excellent lightning rod, so good judgement caused it to be left behind. 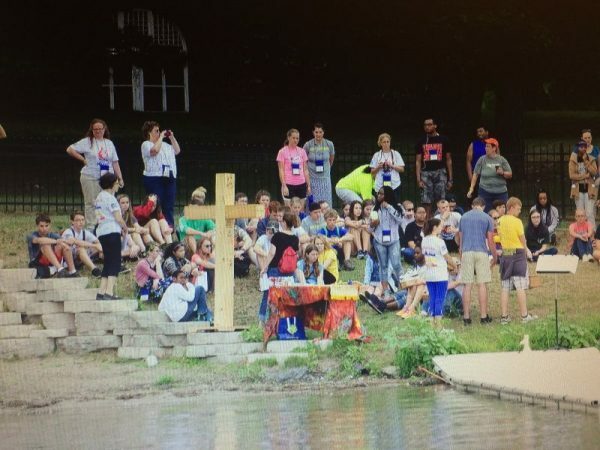 The pilgrims spent the day enjoying Orchard Lake in prayer, service, and playfulness. The day was filled with breakout community service sessions, presentations, and group prayer. Ever kept in motion, they recorded thoughts in souvenir passports, held small group discussions, and leafed through their blue guide books. The books were a special contribution by The Polish Mission, originally printed for attendees in Poland by our colleagues at the Institute of National Remembrance (Instytut Pamięci Narodowej – IPN). In it, the briefest of summaries of Poland’s history were detailed in vivid form, allowing readers to fully embrace the surrounding culture. Though our pilgrims were far from Poland’s borders, Polish culture is alive and well in Orchard Lake. Amidst a variety of breakout sessions, pilgrims had the opportunity to take in several exhibits, made available by both the Archdiocese of Detroit, and The Polish Mission. In the library, exhibits were on display alongside the famous “Papal” kayak, and in the dining hall, pilgrims had the opportunity to experience They Risked Their Lives, created by the POLIN Museum of The History of Polish Jews, and brought to the Polish Mission in cooperation with the Polish Consulate of Chicago. They Risked Their Lives details new research about the role of non-Jewish Poles who risked everything to save their Jewish neighbors from death during the Holocaust. Named 2016 European Museum of the Year, the POLIN Museum exhibits the finest cutting edge of the often generalized history of Polish-Jewish relations. After an 8:30 pm vigil Mass celebrated by Archbishop Allen Vigneron and concelebrated by Auxiliary Bishop Michael Byrnes, the pilgrims prepared for a special gift and presentation from The Polish Mission. JJ once again met his good friend the microphone and expressed gratitude to all the participants, and pointed out a special mark on the well-known icon of Polish Christianity, the Black Madonna of Czestochowa. “We all have scars of some type. Even the Black Madonna bears a scratch on her cheek, given in anger, and borne to this day as a symbol of the triumph of good over evil.” With those words, the audience learned of what they would soon experience: Forbidden Art. Many know of the three-ton traveling exhibition and educational program, created by the Auschwitz-Birkenau State Museum of Poland, and presented in the United States in exclusive partnership with The Polish Mission. Awaiting its premier at University of Michigan-Dearborn this September, Forbidden Art was constructed for our WYD guests in the Galeria, amidst a most special and rare collection of artifacts, including a tapestry given to us by St. John Paul II, and even a collection of three zucchettos in purple, red and white. All had belonged to St. John Paul II. Experiencing Forbidden Art was a high point of the WYD experience, done in solidarity with Pope Francis’ own journey to the Auschwitz site. As he prayed for peace and the repose of so many souls, so too were the pilgrims encouraged, as they viewed examples of artwork created by prisoners of the concentration camp, as seen at venues across the United States, from UCLA to the Eisenhower Presidential site, to United Nations Headquarters in New York. Many wrote personal messages on a massive 200-foot scroll in the Galeria. The scroll, which has traveled across the country with the exhibition, bears the reflections of countless attendees, in many languages. When the tour of Forbidden Art is over, the scroll will be ceremonially presented to the Auschwitz Museum, where the messages of thousands of exhibition guests will become part of the permanent collection of the museum. Afterward, all enjoyed a special sweet treat: The Polish Mission’s signature offering to our guests, Kremówki! The flaky custard-filled pastry has become a staple of our Polish hospitality ever since St. John Paul II declared it his favorite dessert. Thanks to the talent of our executive pastry chef Emily VanNest, the tired pilgrims, with full hearts and sore bodies, were no match to the temptation of the expertly-crafted Polish treats. Guided by a charming path of glowing fire torches, the pilgrims made their way from the Galeria lawn back to Old Gym, with smiles on their faces, and a little powdered sugar on their fingers.